When Noah was born one of the fist things someone said to me “There’s never been a better time in the history of the world for someone to be born with Down syndrome!” I think that’s a fantastic (and true) quote, and I couldn’t agree more. There are so many resources (and research) available today to help children with Down syndrome reach their full potential, all of which will only continue to grow as we head into the future. So that quote will continue to be more true as time goes on. We Hit The Pediatric Therapist Jackpot! We were very fortunate to have found a team of outstanding physical, occupational, and speech therapists when Noah was only a few weeks old that have helped him in more ways than we count. We are incredibly grateful for these folks! What I especially love about this team of therapists is that they are always trying new techniques to help Noah reach his goals. (Be sure to check out this list of characteristics to look for in your child’s therapist.) 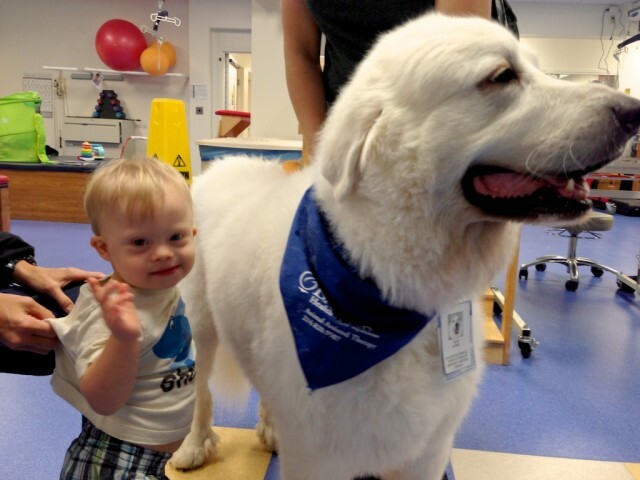 For instance they started using pediatric treadmill therapy with Noah before he was even 12 months old! 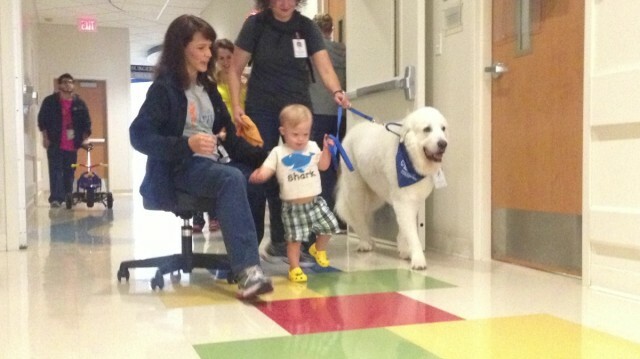 In addition to that, they have recently started using a therapy dog to help him learn to walk on his own! Pretty cool, huh? 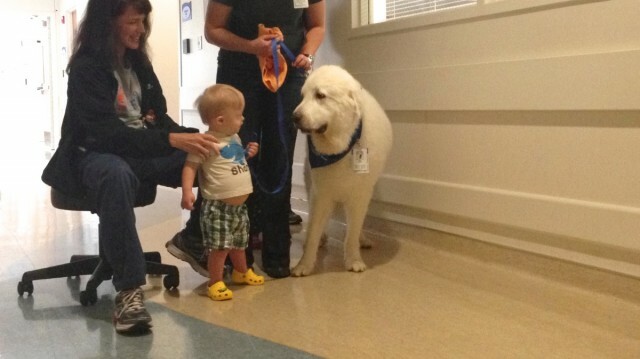 How Noah uses a therapy dog to learn to walk. 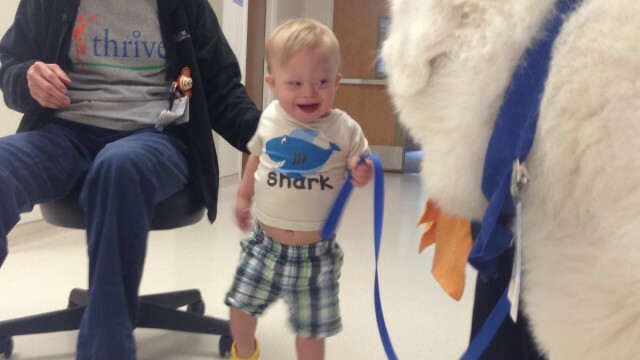 As you can see in the video, Noah’s physical therapist has him hold on to the dog’s leash and “walk the dog” while sits behind him in a rolling chair holding on to his hips to help him keep his balance and maintain correct posture. He is pretty wobbly and hard to hold on to due to his hypotonia, but all and all I think he did a great job, and couldn’t be more proud of him! 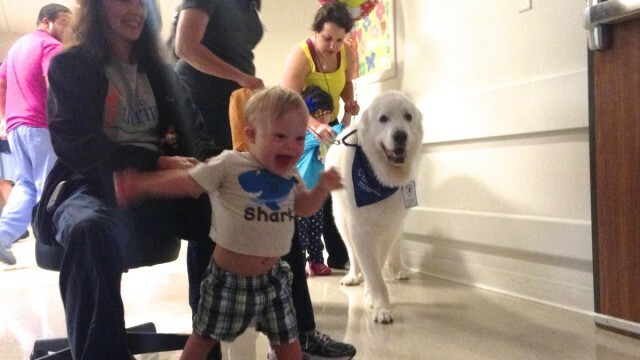 A Steady Gait: Properly trained therapy dogs are able to move forward at a steady pace that’s easily adjusted as the child speeds up or slows down. In other words, the dog will keep up with the child. Since Noah’s just learning how to walk, he isn’t very fast or steady, and we don’t have to worry about a therapy dog like the one he’s using in today’s video charging forward unexpectedly pulling Noah with him. Increase Attention Span: Children (and dads, like me) can find it hard to maintain focus on a specific task for long periods of times. In fact, some days Noah isn’t into therapy at all, and doesn’t want to do anything while we’re there. However, studies have shown than when therapy dogs are present children are more engaged and can stay focused on the task much longer. As you can see in today’s video Noah did a great job walking around the building with the dog and didn’t want it to end when he was finished. Increases Confidence: As a child starts to see improvements toward their therapy goals while using a therapy dog, there confidence goes up , which results in the child meeting more milestones and becoming stronger in existing areas. Reduces Anxiety and Fear: Working on a new goal can create fear and anxiety no matter how old (or young) a person is. The use of animals in therapy produce a calming effect, and helps the child feel more comfortable so that they can work on their therapy goals. These five tips are just the tip of the iceberg. There are lots of other benefits to using therapy dogs and many studies out there for you to read if you’re interested in learning more. 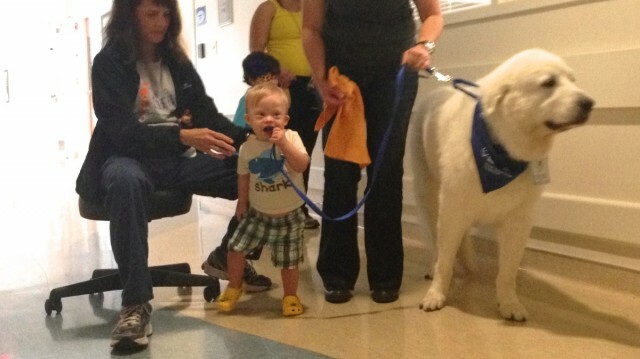 Here’s a few fun pictures of Noah getting his therapy dog on…! 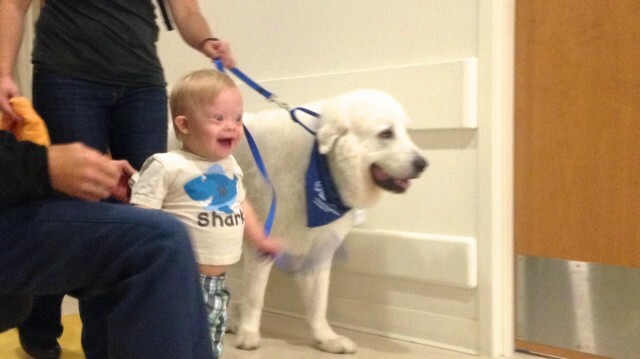 This entry was posted in Down Syndrome, English and tagged Down Syndrome, Therapy Dog. « Un trophée ‘Special Olympics’?